After resting a bit and showered, I did a bit of research on the Internet looking for authentic Cambodian food. 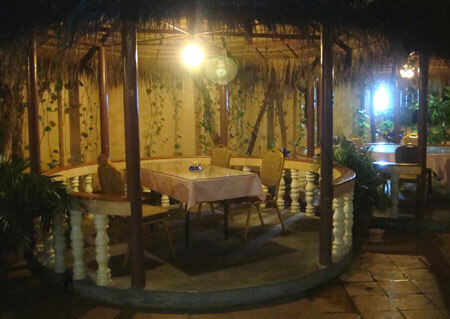 Most of the sites recommends restaurants that are located by the Mekong Riverfront area. Most of the sites are owned by Westerners and I’ve always skeptical about their Asian food recommendation. So I decided to just walked around a bit and try to see if there’s any stalls or restaurant that will catch my attention. Zach and I walked towards the direction of the famous Riverfront area. We have no clue how far it is from our hotel but we just walked for a bit to get the sense of what is around our hotel area. After 15 minutes walk, we stumbled upon a Vietnamese restaurant. Since we were hungry and more familiar with Vietnamese food, I decided to just settle for Vietnamese food instead of Cambodian food. I always make it a point to eat local food whenever I’m in that particular country. I made a mental note to myself that by tomorrow I will have to taste some local cuisine. 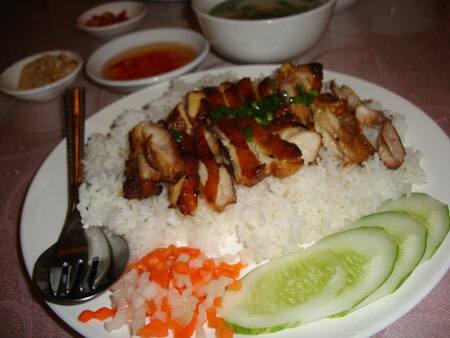 The Vietnamese restaurant by the name of Saigon City looks pretty classy. I have no idea how much our dinner would cost us but we will just give it a try since we are hungry. We wanted to sit outside but there seems to have some small bugs on the table. It looked like dry tiny leaves but upon checking it properly, it is some sort of small bugs that I’ve never seen before. We decided to just sit in the air condition are of the restaurant. 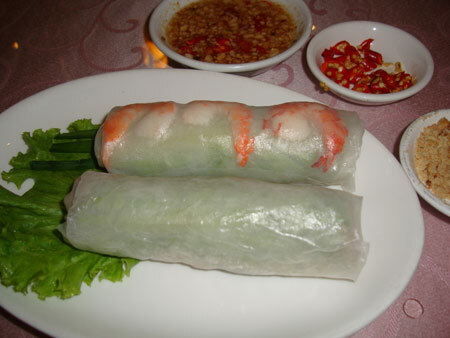 For starter, we ordered 2 kinds of Vietnamese springroll. One is stuffed with minced pork and the other with shrimp. I’m quite familiar with this dish as it is quite mainstream. For my main course, I ordered a chicken BBQ rice set. It comes with soup and some cucumber. The dip for the chicken is sweet chili sauce. I enjoyed the food very much but some what I’m disappointed with myself for not being a little bit more adventurous. I played safe and ordered food that I’m familiar with. I should be eating authentic Cambodian food instead of Vietnamese food. At least I’m not eating KFC or Mcdo. Oh well, is only my first night in Cambodia and I vowed to find some good Cambodian food for my next meal. So for 2 Vietnamese Chicken BBQ set meal, minced pork spring roll, prawn spring roll and 2 bottles of mineral water, the meal cost us USD12. After dinner we decided to go to the Riverfront area where there are a lot of pubs and bars to check out the night life scene. We asked the waiter in the Vietnamese restaurant whether it is walking distance. He said is better for us to take the tuk-tuk. It will cost us around USD2 for the both of us. The ride along the Sisowath Road was pretty cool and we saw a lot of hotels, bars and restaurant along the way. 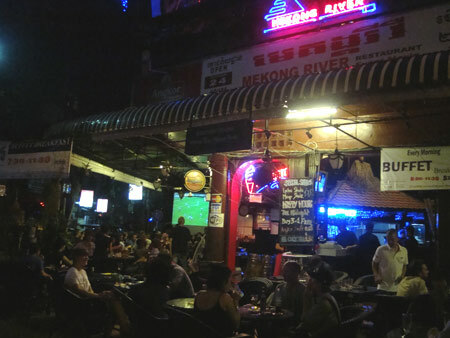 All the hip establishment is facing the Mekong River and it looked like a beach from far. This is the biggest river I’ve seen all my life. We asked the tuk-tuk driver to stop when I saw a lot of people in Mekong River Restaurant. Most of the customers are tourists and I’ve always enjoyed chilling in places like these. You get to mingle with other tourists and share tales. I also always make it as a practice to drink local beers whenever I’m visiting a country. Angkor beer is the beer of choice for many and we decided to give it a try. We were so happy when the waiter told us the price for a mug is at USD0.60. I do not consider myself an alcoholic as there are times where I do not drink for a month. But on occasions like these, I can sometimes drink up to 20 mugs. Everybody is so relax here as they are tourist on holidays. There’s the normal big screen tv showing football matches. After many years of drinking beer, I still can’t really tell the difference between a good or a bad beer. There’s a trick to make all beer turn good. Just drink 5 mugs or glasses really fast and most of the time, the beer will taste really good and everyone suddenly is your brother or sister. 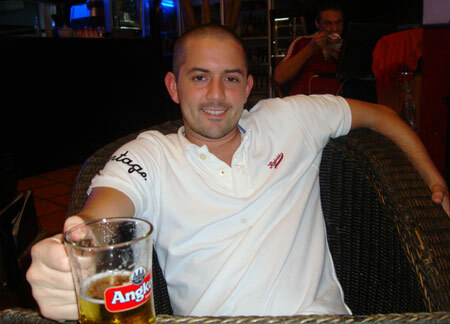 In fairness, Angkor Beer does taste really good. So with USD0.60 for a good beer, I bet you can imagine how many beers that we gulped that night as part time alcoholics.